I created this big poster freebie for you to create your own Senior Bucket List. There is a blank version linked below. Just follow the directions so that you can fill it with all your own bucket list items in beautiful and huge fashion. 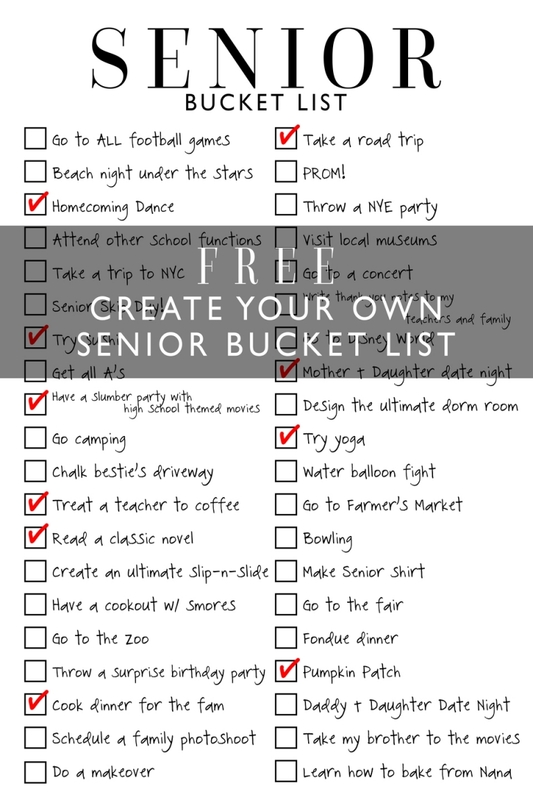 Feel free to use some of the ideas above or snag some ideas from my other Senior Bucket List Printable here. Save this Blank Senior Bucket List PDF file to a zip drive. Find a spot in your home where you can hang your new Senior Bucket List and start filling it out. Take a before pic beside your bucket list and share with me using the hashtag #co19bucketlist or tag @iwpseniors on FB so I can see! Take an after pic beside your bucket list when it is complete and let me see all you did! Share this bucket list with your besties so they can join in the fun too. Happy Senior Year, Sweet Friends!